Identify new locations for your stores or restaurants and understand the health of the overall location. Gain the ability to view all of your stores or restaurants in one place without having to physically visit each location. 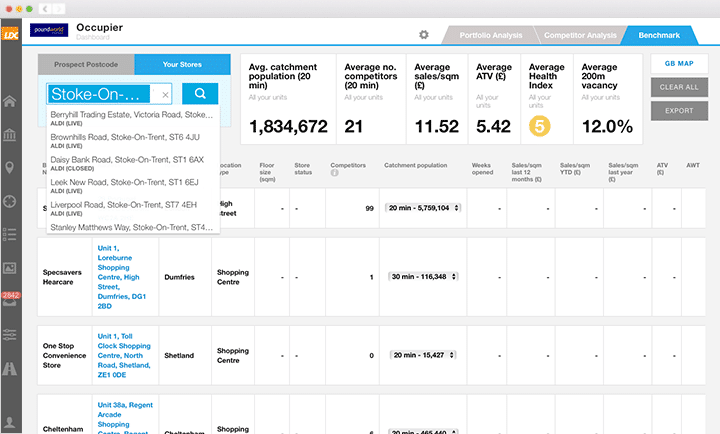 Add your competitors to your dashboard and get instant insight to their current store locations and where they have expanded. 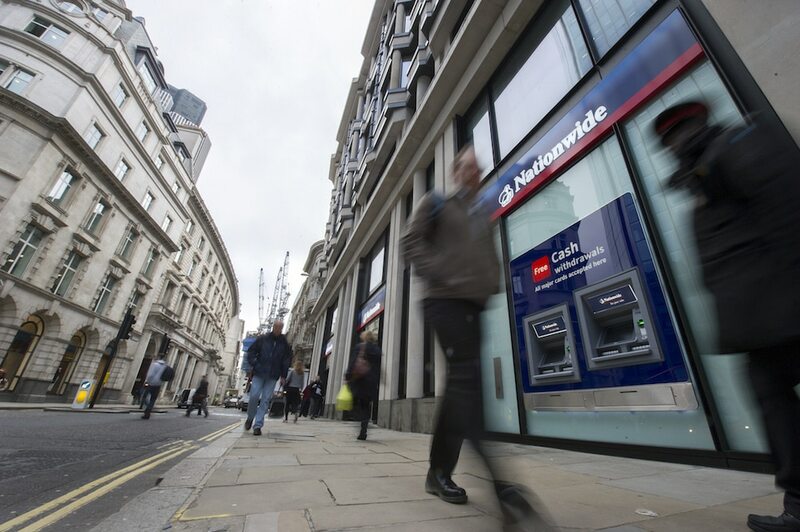 Find out how Nationwide were able to understand the local retail environment of individual branches and build robust forecasting models with LDC. Property is one of the largest costs to any occupier. So it is critical to make the right decision. Using LDO you can quickly understand what has happened in a shop, street, town, shopping centre or retail park over time (back to 2008). 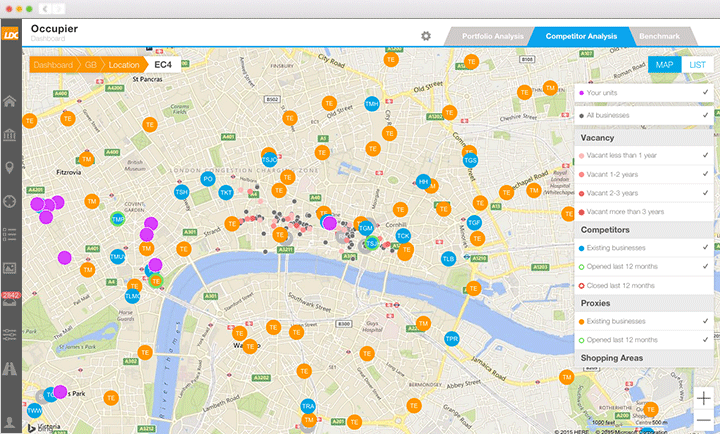 Furthermore you can see demographic and catchment data for any location. This information will help you identify new locations and make decisions based on evidence rather than gut-feeling alone. LDO enables you to see what is happening around your stores, from drive time populations to competitors/proxies, vacant units and the proximity of competing locations. In addition, in partnership with Morgan Stanley, we have developed a Health Index, which is comprised of 12 key environmental variables that impact store locations. By benchmarking your store performance to this index and understanding the situation from the ground up you can see changes across your portfolio which in turn leads to better sales/store profitability forecasting as well as improved decision making on store locations and profiles. By adding which competitors/proxies (you can add up to 20) you want to benchmark against you can immediately see each location’s profile across the country with options to refine down to regions or specific location types. Our in-depth competitor/proxy analysis quickly and clearly identifies where your competitors/proxies are opening and closing near to you or indeed where you are not present. This delivers powerful impact analysis as well as flagging up potential locations you might not have previously considered or indeed avoid if your competitors have failed to succeed (closures). 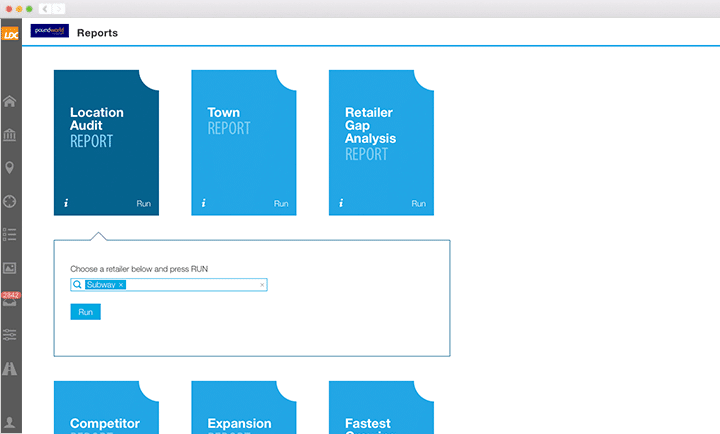 In addition LDC tracks the density of competitors around your stores which further enables you to identify a tipping point in store performance and where it might happen next. Mamas & Papas worked with LDC on an initial strategy review for our London expansion. We needed granular and transparent data which would make it very easy for us to map out similar and competing brands, market health and to assess opportunities for the Mamas & Papas concept across the capital. The resulting data, maps and review workshop have helped prepare us for the next phase of our expansion and made a complex market much more straightforward to assess. We look forward to partnering with LDC again in the future. 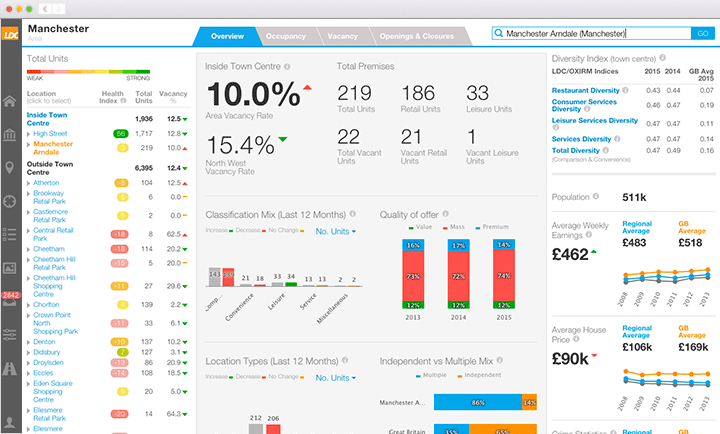 With the Location Overview Dashboard you can begin to understand drivers of change within a centre and the differences between different locations within that centre. It also allows you to get a feel for the quality of the offer, the clustering and the mix of a location along with details and pictures of every shop. Furthermore you can view the demand profiles through demographic data such as employment profiles, average weekly earnings, crime rates, unemployment rates and house prices. 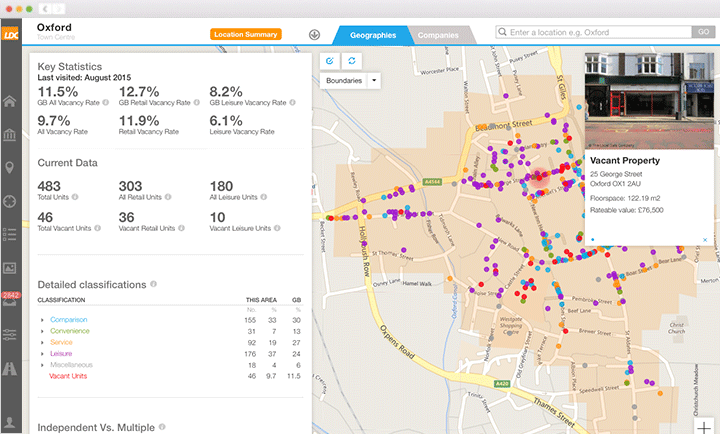 The Health Index allows you can benchmark over 3,000 locations against a health index with 12 data inputs (catchment, spend, occupiers and vacancy rates) that correlates results to large, medium and small high streets, shopping centres and retail parks. 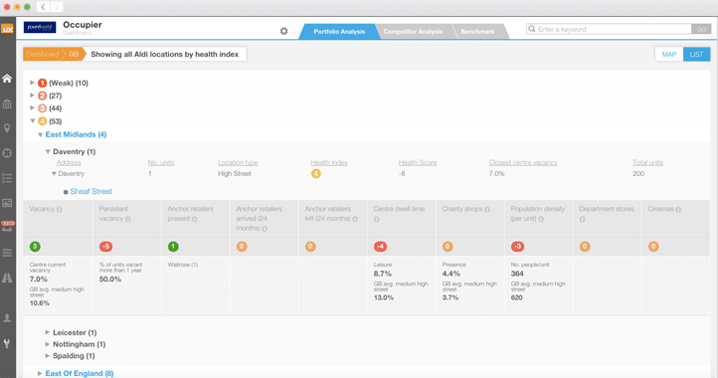 It has been proven to be a robust proxy for location health to identify key trends over time and has been developed in partnership with Morgan Stanley. You can also bespoke the index to your specific business criteria and quickly analyse how your stores score and whether their locations are strengthening, stable or weakening. The interactive map functionality brings the data to life and gives context to it. Here you can understand the relative importance of competing locations, clearly see clusters, identify prime pitch or see vacancy hot-spots. It is also possible to filter, zoom in or export any of the data you see on the map. Our ‘bespoke boundaries’ tool also allows you to create bespoke areas for analysis. Quickly identify drive time catchments from a location by up to 10, 20 or 30 minutes drive time. You can also see where your other stores lie within these catchments, as well as the stores of your competitors or proxies. 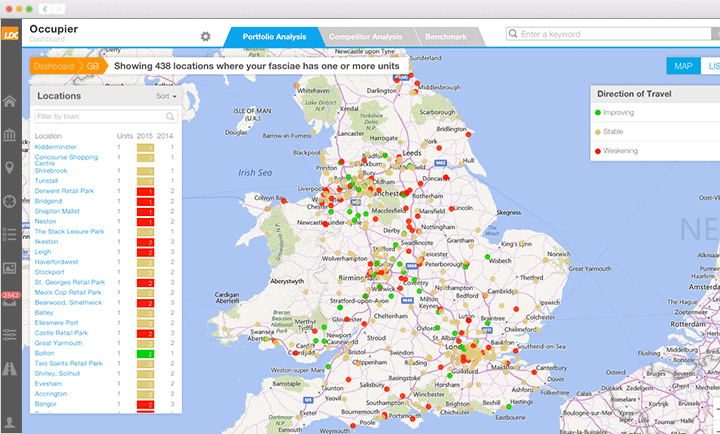 Use LDC’s benchmark tool to see how prospective locations sit alongside your existing portfolio. You can also use the benchmarking tool to understand the potential impact of cannibalisation or competition along with other key variables such as health score, vacancy rates nearby and catchment population. LDO has a wide number of reports that enable you, at the click of a button, to export detailed reports. 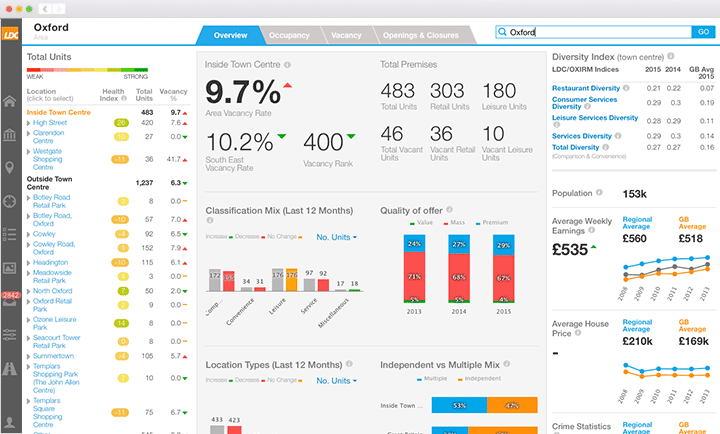 Reports include detailed analysis of a retailer’s locations, town reports, gap analysis, competitor analysis, expansion opportunity reports and market reports including fastest growing fascia. All reports provide historical analysis in order to understand the trends happening across your current and potential locations. Measure the vitality of a town or centre in terms of vacancy, anchor retailers presence, leisure offer and dwell time, charity shops presence and population per shop. A key indicator for the ‘direction of travel’ in which a town or centre is moving, highlighting whether a town or centre is improving, stable or in decline. LDC does not just rely on the data it collects in the field but also overlays a growing number of datasets to ensure you have the best insight upon which to make decisions. This dashboard displays the vacancy rate vs. the number of units located within a 200 metre radius around a target location or asset within a town or centre. Average historical ‘Retail and Leisure’ vacancy combined for all High Streets, Shopping Centres and Retail Parks in which your store/selected fascia is present. The mix of businesses in a location determines its attractiveness. Benchmark these variances to similar but better-balanced locations. The ratio between independents and multiples determines the character of a town. Finding the right balance is key to the success of a town or location. Track proxy retailers (those retailers that are good to be nearby) and identify new opportunities based on previous experience and success. Identify your competitors and see where they are opening or closing stores in and around your locations or even in locations where you have no presence. Our data is the most accurate and detailed data available on the market today. 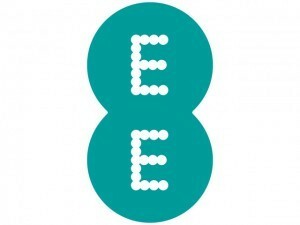 We update our data more frequently across more locations and in more detail than any other company out there. We physically visit and verify over 550,000 retail & leisure premises across Great Britain on a strict 6-12 month cycle. From the remotest locations in Scotland to the sprawling cities of Southern England we’ve got it covered. They say an image paints a thousand words – now you can see every detail from the comfort of your desk. Our team of 70+ office and field researchers are continuously checking, verifying and updating our database. Not only do we deliver the very latest data & insight on the retail & leisure market but we go back, way back to 2008. As if physically visiting each unit was not enough, we triple-check every update back in the office for accuracy. Get the national view of the retail & leisure landscape by visiting thousands of high streets, shopping centres and retail parks. Want to find out more? Speak to our team of experts.